Ground Name: Raymond McEnhill StadiumCapacity: 3,500 (Seats 500)Address: Partridge Way, Old Sarum, Salisbury, Wiltshire, SP4 6PUTelephone No: 01722 776655Fax No: 01722 776666Pitch Size: 115 x 76 yardsTeam Nickname: The WhitesYear Ground Opened: 1997Home Kit Colours: Black & WhiteOfficial Web Site: www.salisburycity-fc.co.ukAbout the Raymond McEnhill StadiumIn 1997 Salisbury City moved to a purpose built stadium at Old Sarum, named after the then chairman. The Raymond McEnhill Stadium’s capacity officially stands at 3,500 (although it is technically able to hold 5,000, with covered accommodation for 2,247 fans. A then record crowd of 2,570 saw the FA Cup first round 2-0 defeat by Hull City in 1998. This figure was beaten twice during the FA Cup run of 2006-07 – against Fleetwood Town in the first round proper and then against Nottingham Forest in the second round, with 3,100 attending the 1-1 draw. 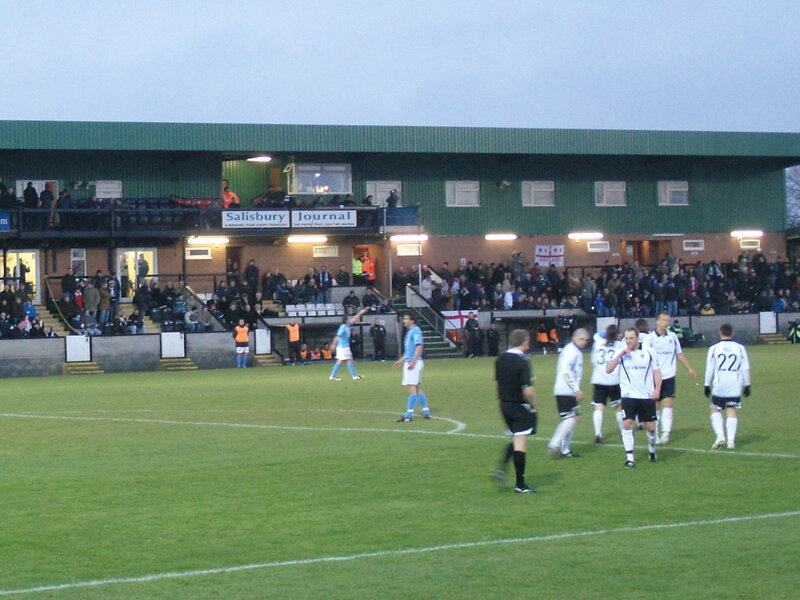 The record league attendance figure of 2,633 was set on 19 January 2008 when Salisbury City played Torquay United. The stadium is basic to say the least. The unusual main stand has six rows of seating at the front, with a small upper tier that acts as a balcony for the four executive boxes. Behind the north goal is a covered terrace of four steps, and the same behind the south goal although this end is uncovered. The east side of the ground backs on to rural farm land and two small stands hold around 100 fans each.How to get to the Raymond McEnhill StadiumThe ground is located to the north of the city on the edge of rolling fields. If you are driving to the ground follow signs for the Park and Ride, where you can either park and walk (it is about 10 minutes away) or carry onto the ground which is off Portway and park at the stadium for £2. For most games you will not have an issue parking here. Alternatively you can park in Old Sarum and walk as it is only around 5 minutes away. Bus 69A runs to the stadium from the city centre and railway station which is a couple of miles away.How to get a ticket for the Raymond McEnhill StadiumEntrance to the stadium is £13 for Adults and £9 for Concessions. This allows entry onto the terrace areas at either end – although you cannot walk around the stadium. For £2 extra you can transfer to either of the covered seating areas. Tickets for 90% of matches played at the stadium are pay on the door. If you want to reserve a ticket in advance then give the club a call on 01722 323100. 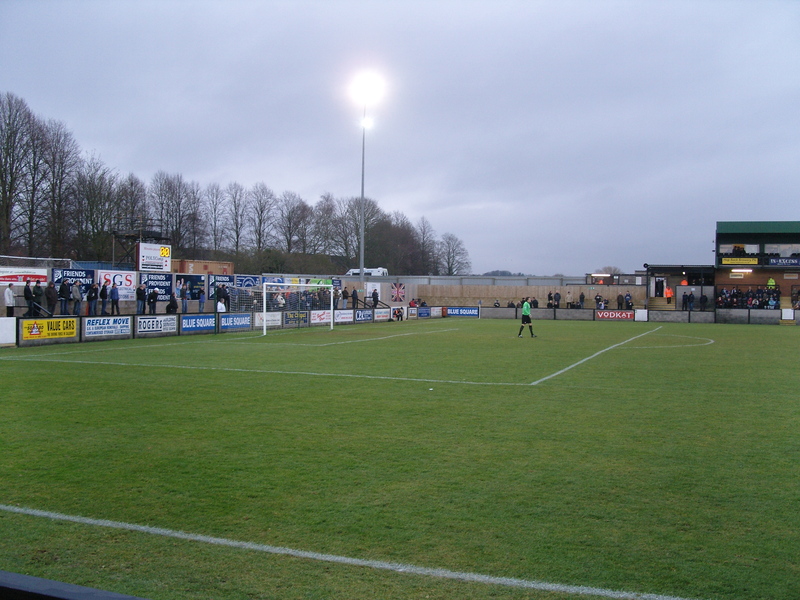 About Our Last Visit – Salisbury City 1 York City 1 – 29th November 2008 For the first time ever I put the destination for this week’s match on the blog and opened it up to you dear readers to determine my destination. Over 50% of your voted for a trip south west to watch the Blue Square Premier league game at Salisbury, which was a popular choice with me – especially as three of the four votes I received were actually from me! So sorry Mr Campbell who obviously voted for the Dagenhame game at Leicester and some sadistic fans who liked the idea of sending me to watch Millwall. Whilst it was never going to be the most exciting game to see, I was fascinated after studying the map to see what the ground was like as it appeared to be located in the middle of a farmer’s field with nothing else around. Salisbury have floated around the Southern sections of the non-league pyramid for most of their sixty year history without actually making any impression. 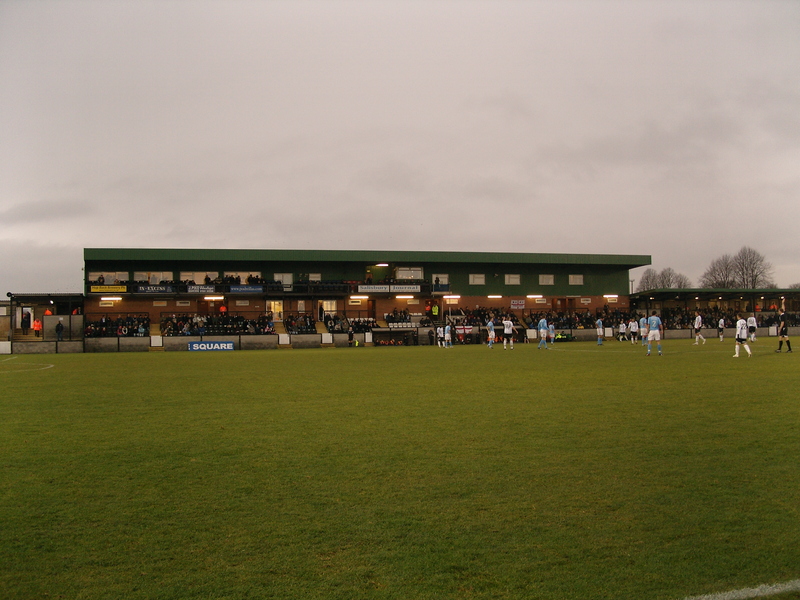 All of this changed in 2005 when under former Southampton midfielder Nick Holmes the club reached the Southern League Premier division, thus moving into the Conference South. In their first season they finished second, and after beating Braintree Town in the playoff game took their place in the Conference National (now the Blue Square Premier) for the first time. During that season they also reached the 2nd round of the FA Cup, and brought the BBC cameras to the Raymond McEnhill stadium when they drew 1-1 with Nottingham Forest in front of a record capacity attendance of 3,100. Last season they finished 12th which was a commendable performance considering that finances were tight. This season the situation has deteriorated and the cup has been forced to off load players, including three the week before this game, despite some decent results. Their opposition know all about hitting rock bottom. It is only four years ago since the club lost their league status after seventy five years in the Football League. Fifteen years ago they beat Crewe Alexandra at Wembley Stadium in the Play Off finals to reach the third tier of English football. 12 months later they nearly reached the now-Championship but lost in the play off semi-finals. Since then things have gone from bad to worse for the club as they have slipped down the league and were embroiled in a strange set of events when US investor John Batchelor took over the club. So since they were relegated to the Conference they have struggled to adjust to life in the Non Leagues and have yet to challenge for a place back in the Football League. So far this season they have struggled, and in the week before the game manager Colin Walker was sacked, and replaced by Martin Foyle. So off I headed, relying on TomTom to get me there. Having only left at 1pm I was concerned that I would not get there in time, but for once traffic was light. As I was directed off the A303 onto some country lanes I started to swear at the small screen in front of me as it seemed to be taking me on a magical mystery tour of Wiltshire country pubs. The road went on and on, with no signs for Salisbury. Eventually after some ten miles I saw a sign for the football ground, and in the distance, in what appeared to be in the middle of a field was a set of floodlights. I was directed into a field next to the “stadium” for a bargain £2, and then headed into the ground. It is certainly a basic affair. One very strange main stand, which is technically two tier dominates the ground. Opposite are two small single stands, either side of the half way line with approximately 100 seats in each. The away fans had four steps of terrace behind the goal and up the side of the pitch, whilst the home fans had a similar space at the far end although it was covered. From the top step you could clearly see the fields with sheep in behind the east side of the stadium. It was a very cold day. After grabbing a tea, and plugging in my IPOD to listen to the latest England rugby disaster I found an empty space on the terrace to watch the drab game. I will not pull any punches on this – although I am sure if it was a nice warm sunny day the game would have taken on a different look. But with the temperature hovering around the 4 degrees mark, and England getting thumped by the All Blacks in my ears it did not inspire me. York City had brought a crowd of around 40 for this game, and the home fans had hardly turned out in force, so when the game kicked off it really was the high point of the afternoon for most. In the first twenty minutes there was not one single chance on goal. Salisbury’s centre midfielder had adopted the Captain Caveman look with ridiculously long hair which would have been too tempting for an opposing player just to pull. In terms of glove watch there was four players sporting them, including the Salisbury centre back who had the short sleeve shirt and glove combination – farcical! The ball spent most of the first half in the air as both teams tried to hit the ball long with little effect. The breakthrough came eventually when Salisbury’s Rory Hill launched the ball long and Charlie Griffin managed to poke the ball past the on rushing Ingham in the York goal and ran past him to finish the job off. OK – confession time. I didn’t actually see what happened. I was retuning my IPOD and as I could not hear the crowd noise I looked up to see Griffin walking the ball into the net, and the York goalie holding his head in his hands. Griffin took his celebration a bit too far and was booked for taunting the one York fan who shouted something at him. The teams took over fifteen minutes for half time, quite sensible considering the plunging temperature, and on the restart neither seemed happy to be out there. York did through everything they had at Salisbury and were certainly the livlier of the two but still created very little, until the Eighty third minute when substitute Brodie turned the ball in from close range to earn a draw for York. So at this point I will offer an apology. I was too cold to inject my normal humour into my report. All I could think of was getting home to CMF and the little Fullers and escaping the rural surroundings. The countryside has its place in our lives, but as a setting for football? No. Perhaps I should have gone to Millwall after all!